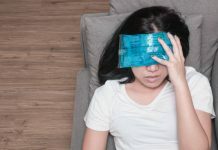 When autumn rolls around and the weather begins to cool down, you may find yourself bundling up with the kids indoors on the weekend. 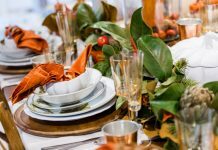 Whether you’re cozying up in the kitchen with pumpkin bread or trying out some fall crafts with the kiddos, this time of the year can be a wonderful time to bond with the little ones and make lasting memories. 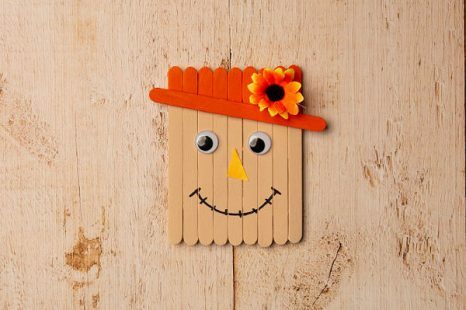 This DIY popsicle stick scarecrow is a craft project you can get the kids started on when you’re looking to spend some quality time with them being creative and festive. 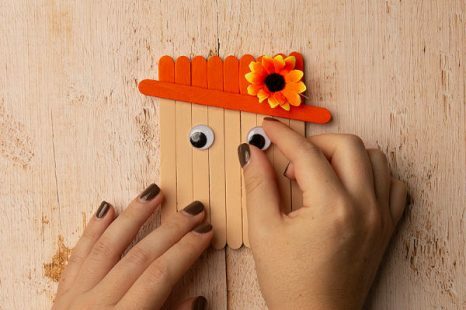 Kids tend to love working on arts and crafts like this and this project is feasible enough for a variety of ages. 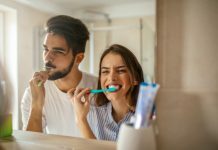 You also do not need a ton of supplies to carry out this DIY project. 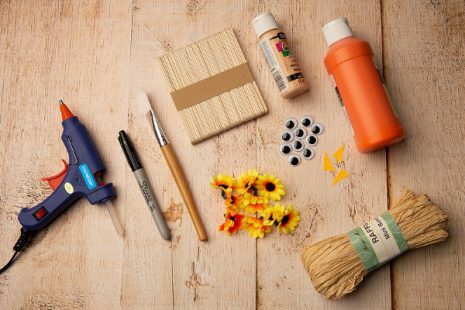 The items needed for fall crafts like this are usually inexpensive and can easily be found at any craft store. 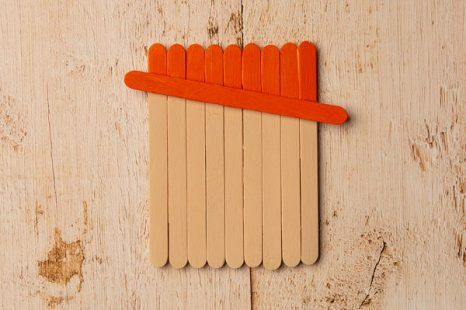 Vertically line up nine of the popsicle sticks next to each other to create a square shape. 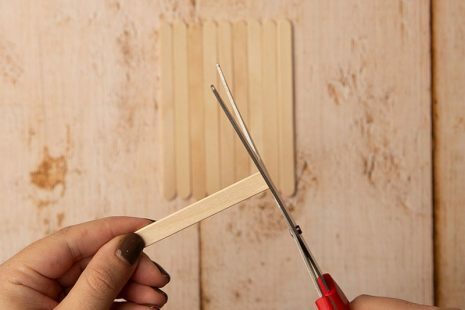 Trim another two popsicle sticks so that they are just slightly shorter than the width of this square. 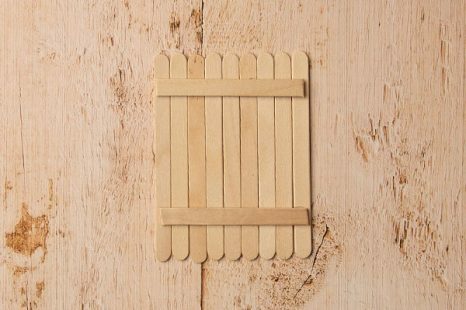 Use the hot glue gun to apply these two trimmed popsicle sticks onto your popsicle stick square, spacing one trimmed stick near the top and another trimmed stick near the bottom (you’re essentially creating brackets on the back of the square). 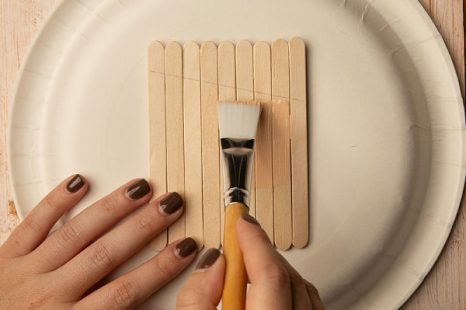 By doing this, you will effectively be keeping the lined up popsicle sticks glued together. 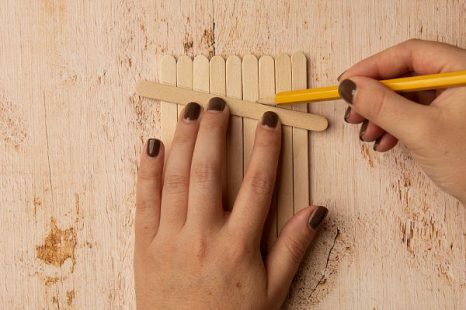 Once the glue is dry, flip the popsicle stick square over so that the trimmed popsicle sticks are not showing. 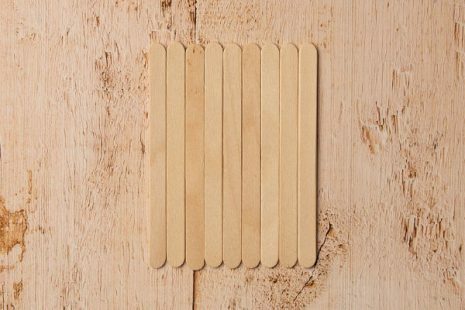 Draw a diagonal line across the top of the popsicle stick square to separate the face area from the hat area. Use the flesh colored paint over the area below the diagonal line. That is going to be the scarecrow’s face. Use the orange paint in the hat area. 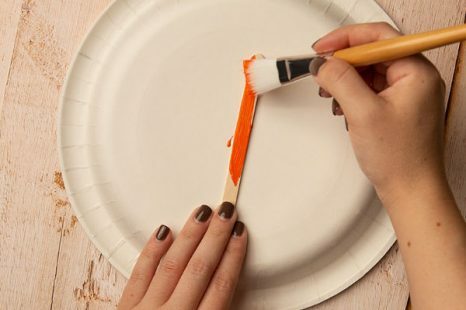 You will also want to apply the orange paint to the extra popsicle stick that hasn’t been touched yet as well. 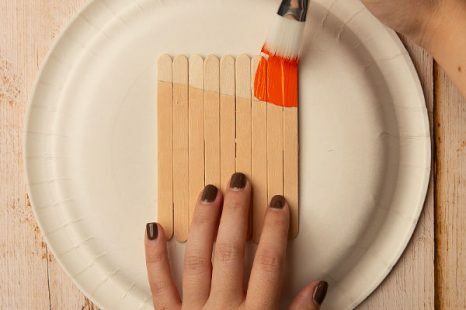 Once the paint is dry, apply hot glue along the diagonal line that you created and apply the single orange popsicle stick on this line. This will be the trim of the scarecrow’s hat. 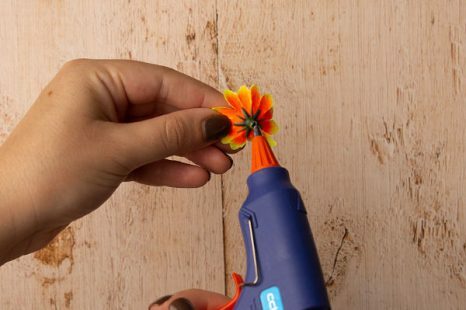 Use the hot glue gun to pin the faux flower onto the scarecrow’s hat. 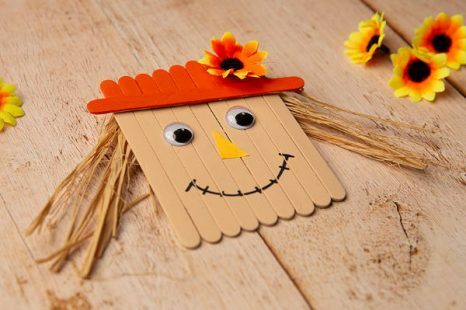 Working on the scarecrow’s face, tear the adhesive cover off the back of the googly eyes and apply them below the scarecrow’s hat. Cut out a small triangle from the corner of the orange construction paper. 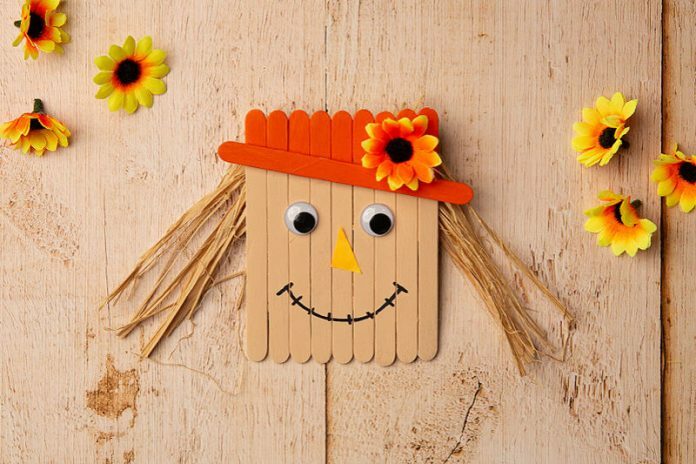 Use the hot glue gun to apply the triangle for the scarecrow’s nose. Draw a smiley face using the black permanent marker. Flip the scarecrow over. 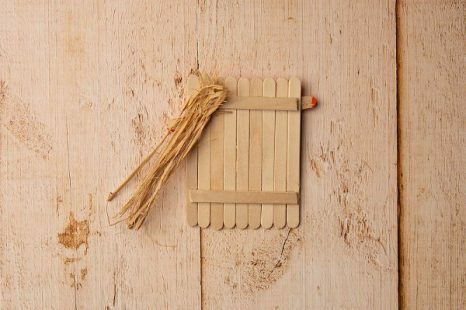 Cut some raffia to create strands of “hair” and use the hot glue gun to apply the raffia to the edges of the popsicle stick, where the hat area is. 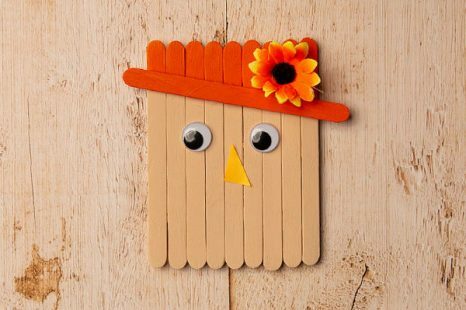 Bonus idea: If you want to turn the scarecrow into something you can pin on your fridge, apply magnet strips to the trimmed popsicle stick brackets on the back!